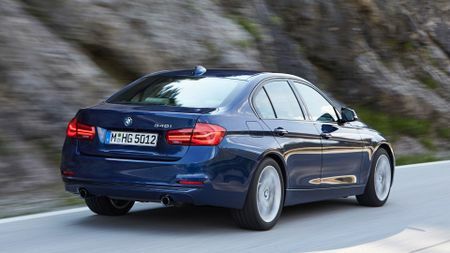 The BMW 3 Series enters its fifth decade with a series of revisions designed to keep it ahead of some very talented rivals, but how effective are they? 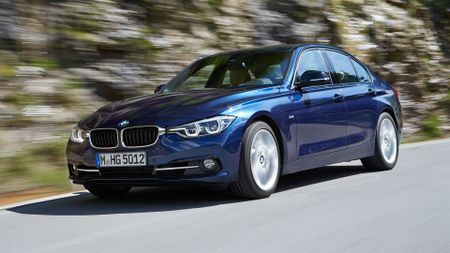 The BMW 3 Series celebrates its fortieth birthday still heading the class it pretty much invented. 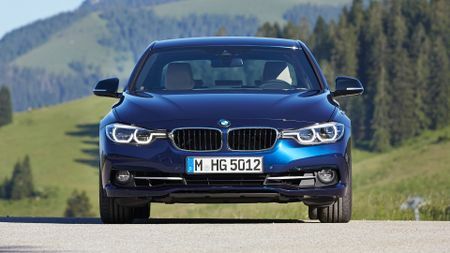 We've tested it here in range-topping 340i guise, but most buyers will be heading for the four-cylinder diesel choices, although BMW will offer a new plug-in hybrid option from 2016. Very obviously a BMW 3 Series. 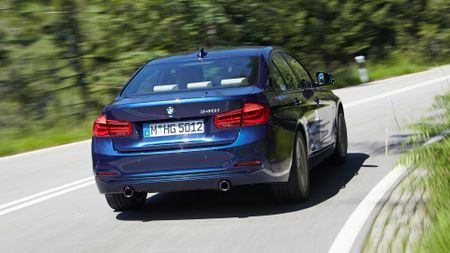 The company's big-selling saloon might be 40 this year, but there’s no mid-life crisis make-over, with BMW’s changes to the 3’s styling very much in the conservative category. There are new headlights, which are a little wider apart, but when the stylists are mentioning that the new grille material allowed better hiding of the Active Cruise Control sensor, then you know they weren’t too taxed in the update. There are new rear lights as well, with LED technology, which are brighter and quicker in operation, as well as allowing a new L-shape signature to the rear. 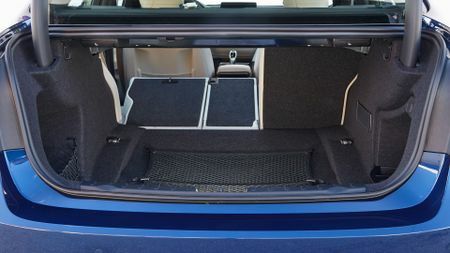 Other than that, you’ll have to be a spec-watching obsessive to really notice the differences, although those with a tailpipe fascination will note that, from the 320i and 320d models upwards, all now feature twin exhausts. If that doesn’t get tongues wagging in the company car park, we don’t know what will. 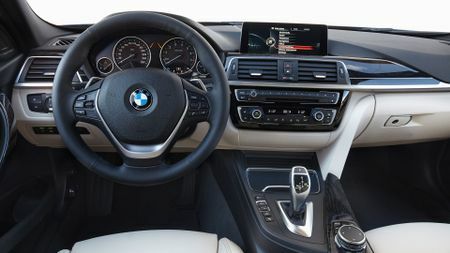 Inside, the changes are in the same 'blink and you’ll miss it' category, although if you’ve spent 15,000 miles a year in a 3 Series you might notice a few different trim materials, new cup holders and chrome accents around some of the buttons and switches. 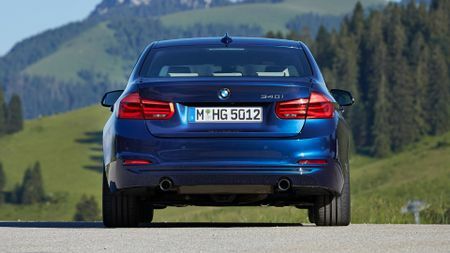 However, the biggest changes come under the bonnet, with a significantly revised engine line-up, headed in petrol guise - if you ignore the M cars - by this six-cylinder 340i model. That the 3 Series is good shouldn’t really come as any surprise, this one more so thanks to its mid-life status. It might not look much different, but under those familiar lines are some serious technical changes. The engine line-up is significantly revised, although at the launch the only car to drive was the 340i. That’s not as a reverential nod to the 3’s 40th year, instead simply because it’s BMW’s first showing of its all-new aluminium 3.0-litre TwinPower turbo six-cylinder petrol engine. 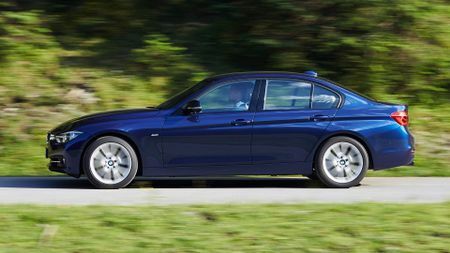 It replaces the 335i, though its 40i name does not signify its capacity, which remains at 3.0 litres. 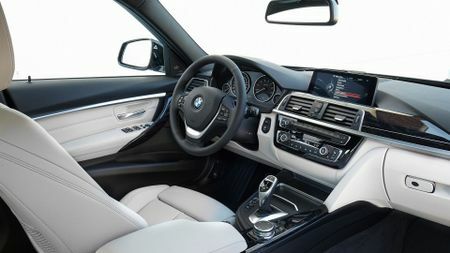 Power increases over the 335i it replaces to 321bhp, torque too increasing marginally, although consumption and emissions improve too, with a combined fuel economy figure of 41.5mpg and CO2 emissions of 159g/km when paired with the optional eight-speed Steptronic automatic transmission. 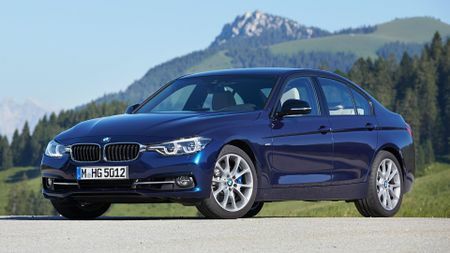 Smooth and powerful as that new six-cylinder petrol flagship is, its 0-62mph time of 5.1 seconds is bettered by the flagship 335d diesel’s 4.8 seconds, while the number that really defines 3 Series sales - CO2 emissions - means only a handful of UK buyers will opt for the 340i. 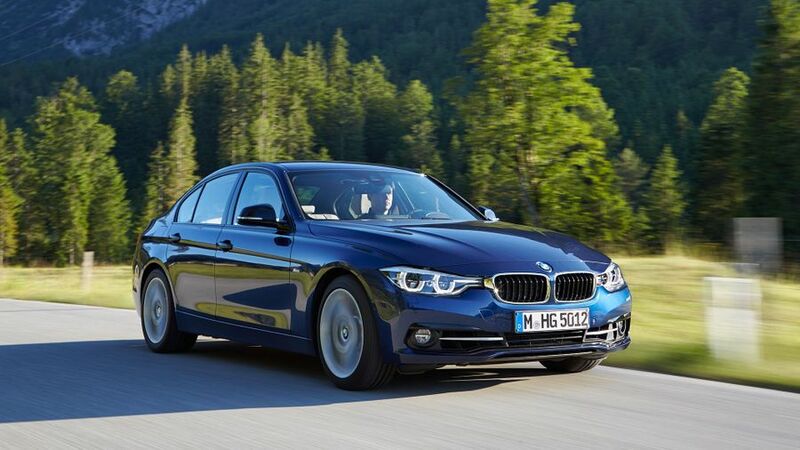 The 320d will take the majority of sales, its four-cylinder TwinPower 2.0-litre turbodiesel producing 187bhp for respectable 7.3-second 0-62mph capability, fuel economy of 67.3mpg and 111g/km of CO2 emissions. 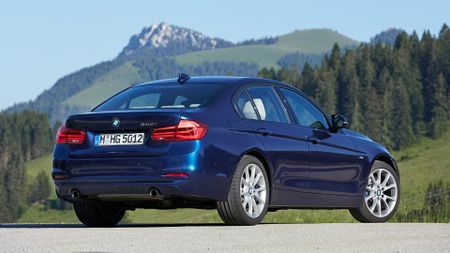 If tax-dodging status is a priority, BMW’s 320d EfficientDynamics Plus improves those figures to 72.4mpg and 102g/km, or 74.3mpg and 99g/km with the optional eight-speed automatic. In the EfficientDynamics Plus models, the 2.0-litre engine’s power is pegged back a bit at 160bhp, but it only adds just over half a second to the 0-62mph time. 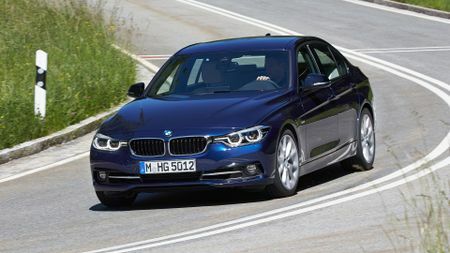 If those figures aren’t good enough for you, BMW will offer a plug-in hybrid 3 Series from 2016, the 330e taking the 320i/330i’s four-cylinder petrol unit and mating it to an 85kW plug-in electric motor. With a maximum total output of 248bhp, the 330e will offer up to 22 miles of electric-only driving, which helps it deliver official combined economy and emissions figures of 141.2mpg and 47g/km respectively. BMW asserts that, while the styling changes are marginal, the revisions to both those engines and the dynamic make-up of the 3 mean it remains at the top of its class. Stiffer suspension mounts and new damper and spring rates have been adopted across the range for a more precise drive, although in the extensively optioned 340i the improvements aren’t all that obvious. It rides with a composure that’s impressive, even on optional M Sport Adaptive Suspension; the standard springs and dampers should offer a touch more comfort at the expense of some outright control. That’s unlikely to be an issue for most drivers, who also won't consider paying more for the optional Variable Sport Steering, as fitted to the 340i tested here - it gives an unusual, artificial response. We’ll need time in a more conventionally specified 3 Series to ascertain if the firm’s claims of even greater dynamism are to be confirmed. Certainly, the old car was a benchmark in this respect, so we’d expect it to remain so. 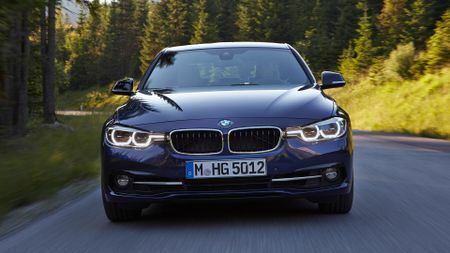 Irrelevant as that 340i engine might be when talking about sales, its smooth, linear power output works very well with BMW’s eight-speed Steptronic automatic. The transmission, improved for the 3’s mid-life revisions, sees less slip from its torque convertor when shifting, ‘reads’ the road ahead via sat-nav to better chose the right gear and allows coasting at speed to bring economy improvements. It’s an option on all models, but its impressive operation, not to mention the benefits it brings in emissions and mpg over the standard six-speed manual, means it’ll be a popular choice. BMW has sold 14 million and counting since it introduced the original E21 3 Series back in 1975, so you’ll not be alone. For good reason, too, as while the 340i here doesn’t perhaps show the 3 Series off in its best or most representative light, the fundamentals of a great compact sports saloon remain in place. It’s a shame that BMW hasn’t been a bit more ambitious in shouting about the changes to the 3 Series visually, but then you only need to look at the forthcoming new Audi A4 to see that in this class, designers fear that radical styling changes could upset loyal customers. 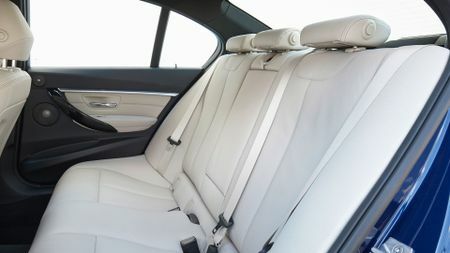 Given the numbers of sales the 3 and its competition account for, that’s hardly surprising, although the Mercedes-Benz C-Class feels fresher and arguably has a nicer interior, even if the BMW promises a sharper drive. How much sharper remains to be seen on a representative UK model. Sensible, starred Merc adds dynamism and style, running the 3 Series very hard indeed. Jaguar’s newcomer a patriotic choice, and a good one, too. A real contender for class honours.